Parkway Playhouse, located in the small Appalachian town of Burnsville, NC, is a haven of theatre talent. While people come to the mountains to get away, Parkway Playhouse is a natural gathering place to connect. Likewise, we are an extension of traditional mountain talents: singing, dancing, and, foremost, storytelling. By giving rise to energetic new voices and through a wide variety of plays and musicals, we invite our audience into experiences that are thought-provoking, adventurous, and entertaining. Together we reimagine the world in every live performance,creating dynamic *creating dynamic conversations that will last far beyond the curtain call. 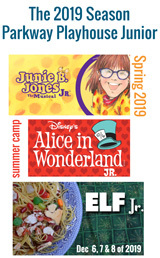 Parkway Playhouse Junior is a theatre arts education program for preschool through high school students. At Parkway Playhouse Junior, students work together creatively to make compelling and imaginative choices both on stage and behind the scenes. Instructors encourage budding performers to reflect on the world in inventive ways through movement, song, props, and all aspects of theatre. Students form lasting friendships, learn well-rounded technique, and develop a deep appreciation for the performing arts in a fun, nurturing environment. Our award-winning program and nationally recognized instruction will prepare students for the future by developing collaboration skills, confidence, and creativity.